How long has the internet been around and no one has illustrated this yet? I am glad to remedy this terrible situation. Here, the mighty Lord Vader finds himself in a familiar turn of events, in what may or may not be someone else’s bathroom. Surely there have been times in Darth Vader’s career where he finds himself the Empire’s ambassador to some granny planet or something similarly quaint. Or, it could be that this actually reflects on his own personal space. We never do see an offical Lucas-approved bathroom, with a bunch of weird grasping robot levers or whatever. What if this is just what he needs to get through the day? A little comforting alone time. I’m sure if there was anyone to criticize his interior design choices they would be quickly force-choked right onto the pile of dead British people that tend to clutter up the Death Star, and no one else would ever know or care, ever again. As much as this is about the Lord Vader, this drawing is just as much about paisley. I had never drawn paisley in my life up until now. Why would I? And yet, this is one of the longest amounts of time I’ve spent drawing anything. Look at all that paisley. Just look at it. The exciting news, of course, is that I plan to make this one into a painting. But because I am still relatively new to the whole art thing, it is going to require a whole bunch of steps to basically ensure I don’t screw anything up too badly. I will be posting updates to this one as it progresses! 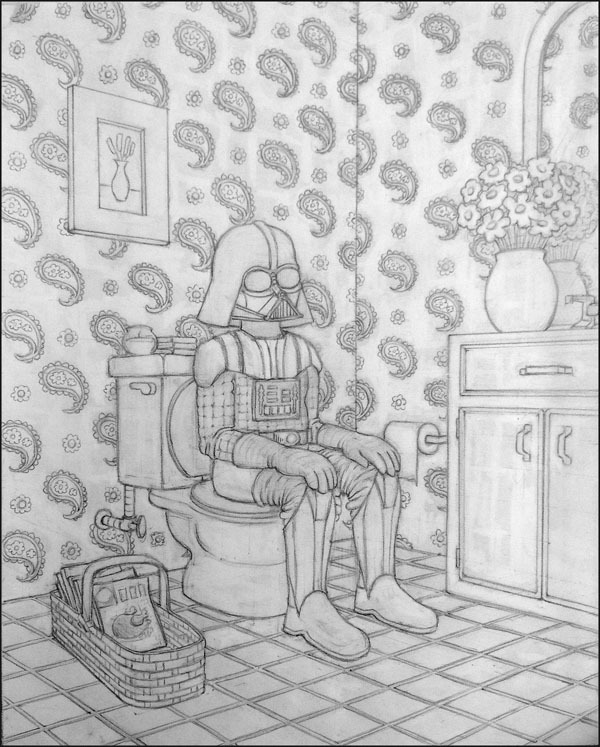 This entry was posted in Originals and tagged Darth Vader, Darth Vader takes a Dump. Bookmark the permalink.